If you need to get rid of waste in Greenville, MI, Fair Waste Company can help you dispose of it. When it comes to waste management, we really know what we’re doing. 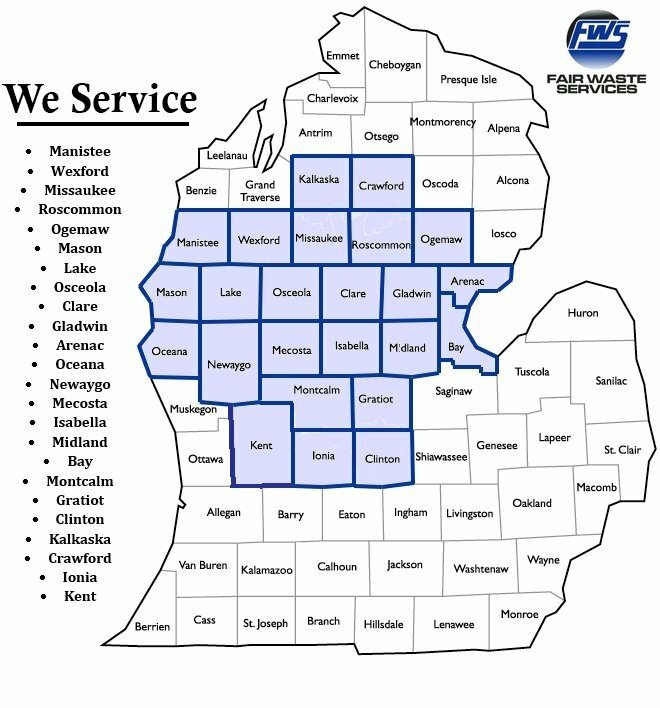 Between our dumpster rentals, recycling services, and roll-off containers in Greenville, MI, we’ll find a way to get rid of your trash. This includes any junk you’ve collected at home and any garbage that was generated by your business, industrial facility, or project site. We also rent out small and large waste containers, which we can drop off and pick up for your small or large cleanup needs. Small containers are great for residential renovation projects, and our larger dumpsters can meet your construction site or business remodeling projects with ease. In either case, we’ll cart your garbage away when you’re finished with your project using our affordable, heavy-duty roll-off containers. While waste is our business, our customer service is anything but garbage. We believe in providing excellent customer service, which is why our knowledgeable staff members are always ready to assist you. Whether you need to recycle scrap metal or order a dumpster to get rid of industrial waste, or anything in-between, we can help you find the right solution for your size project. Contact us to get a quote for your waste management needs today.